The ASPRS CRR/Puget Sound Region Joint Technical is coming up and we still have presenter slots available. Please send your registration and abstract, if you are presenting, to Matt Boyd by September 30th. We're looking forward to seeing you there! *Registration fee waived if students register for ASPRS membership at session. $13.00/hour – no benefits. Duration 3 to 9 months (based on 30 hours/week). Vanpool from SE Portland and bus passes available. As of Sept 27, 2011 - this position has been filled. This year, the School of Information Systems and Technology (SISAT) at Claremont Graduate University is hosting a Student Geographic Information Systems (GIS) Challenge Contest for GIS day on November 16th, 2011. We are sponsoring this contest in collaboration with Esri to encourage graduating (or recently graduated) students in pursuing innovation and advanced education in GIS and related information sciences. A national press release was just released for the contest can be found at http://www.prnewswire.com/news-releases/claremont-graduate-university-launches-scholarship-contest-for-student-gis-software-developers-129652653.html. As summarized in the release two grand prizes will be awarded, one in for transportation safety applications, and one for health/humanitarian applications. *The grand prize includes: $1000 in cash, a trip to Claremont, California for GIS Day, and $35,000 Tuition Scholarship *toward a graduate degree from our school. Click here for a flyer about the competition. Those who are interested can register on the SISAT Advanced GIS Lab (A-GIS Lab) website and will receive the full proposal submission guidelines when they do so. Please visit the site at: http://www.cgu.edu/gischallenge. "Last July, the National Geographic Society released its first comprehensive map of Cuba in more than 100 years. The new, detailed map includes two new Cuban states and is worthy of recognition in its own right — but the real story is the cartographer behind the project. Cartographer and geographer Juan Jose Valdes fled Cuba for the United States when he was a young boy. Today, he's not just any geographer, but the geographer at National Geographic. In a special broadcast in front of a live studio audience, Valdes explains the features of the new map of his homeland and what it meant to him to create it. 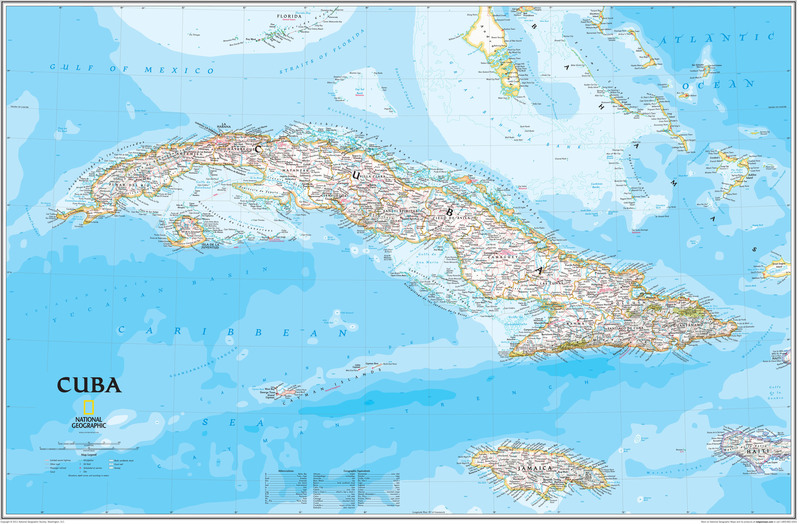 (Click here for a closer look of Valdes' map of Cuba.)" A new book has just been realized by Ken Jennings. Below is the summary of the book taken from Ken Jennings website. "Maphead: Charting the Wide, Weird World of Geography Wonks is Ken's followup to his 2005 best-seller Brainiac. Much as Brainiac offered a behind-the-scenes look at the little-known demimonde of competitive trivia buffs, Maphead finally gives equal time to that other downtrodden underclass: America's map nerds. In a world where geography only makes the headlines when college students are (endlessly) discovered to be bad at it, these hardy souls somehow thrive. Some crisscross the map working an endless geographic checklist: visiting all 3,143 U.S. counties, for example, or all 936 UNESCO World Heritage Sites. Some pore over million-dollar collections of the rarest maps of the past; others embrace the future by hunting real-world cartographic treasures like "geocaches" or "degree confluences" with GPS device in hand. Some even draw thousands of their own imaginary maps, lovingly detailing worlds that never were. Ken Jennings was a map nerd from a young age himself, you will not be surprised to learn, even sleeping with a bulky Hammond atlas at the side of his pillow, in lieu of the traditional Teddy bear. As he travels the nation meeting others of his tribe--map librarians, publishers, "roadgeeks," pint-sized National Geographic Bee prodigies, the computer geniuses behind Google Maps and other geo-technologies--he comes to admire these geographic obsessives. Now that technology and geographic illiteracy are increasingly insulating us from the lay of the land around us, we are going to be needing these people more than ever. Mapheads are the ones who always know exactly where they are--and where everything else is as well." "Maps for Change is an organization dedicated to empowering people with GIS skills to be practitioners and volunteers by bringing people with GIS skills and NGOs together. Maps for Change includes both students that are seeking practical opportunities for their GIS classes as well as GIS professionals from around the world. " If you are a student looking for some practical GIS experience, check out this opportunity. "GIS Employment Outlook: Relatively Rosy for State and Local Government Professionals"